Have you visited the Egyptian land in UAE? Long ago before the sun stepped out to the balcony, he sent his chariot to take a look outside and then slowly rose above the sky, red as an apple and bright as the biggest star. The glory of the shining Sun featured an image of heavenly Christ in the mirror of an ocean. The scintillating Sun, the beauty of Mother Nature is admirable, thank you for giving me an opportunity to witness the marvelous sight. This was at Palma Beach Resort and Spa in Umm Al Quwain, one of the seven emirates in the UAE. I woke up early to capture these shots, couldn’t afford to miss it! It was a perfect weekend getaway with family and the perfect day as it was the full moon day. So apart from the glorious sunrise, we also experienced full moon over the ocean at night. The sights are both live and fresh in my mind as I am putting them down on the paper. Palma Beach Resort is a 4 star, luxury heritage resort located towards the East of the UAE. Their visitors come to enjoy the facilities of the resort from all over the Emirates and mostly from Dubai and UAE. The Ancient Egyptians Art; painting, architecture, sculptures, Egyptian hieroglyphs by alphabetization provide an extraordinary sense of Egyptian culture. Rooms: The rooms are spacious, clean and smell fresh. Every room opens to the balcony or porch; our room faced the ocean while some rooms faced the pool. Everything you need for a comfortable stay was available in the room. There are 4 pools within the resort; I think my kids enjoyed all of them. The pool with the slides (similar to the waterpark) was the major hit among kids and families. Palma Saray: Palma Saray is the beach café, extending to a floating restaurant. Dinner at Palma Saray on a spectacular night was like a dream come true, very romantic and prodigious. The shimmering light of the moon on the water was as precious as jewels. The ambiance, the vicinity, the food was all phenomenal. A few boats passed by once in a while to turn the restaurant into the seesaw. Charcoal chicken and fish seem to be a specialty of Umm Al Quwain, we visited here often years ago to have it as referred by a friend. The dish was much relished by hubby and the little one; it’s the healthiest meat one can have. Palma Spa: OMG, wish I had asked for something else also, 🙂 Royal Spa treatment at Palma Spa was a much-needed escape. Last few months have been harsh on me physically and mentally as we moved places, the spa treatment gave me the opportunity to unwind and to forget the outside world for a while. I can’t believe I spent almost 4 hours on myself. This was the desired staycation for me. 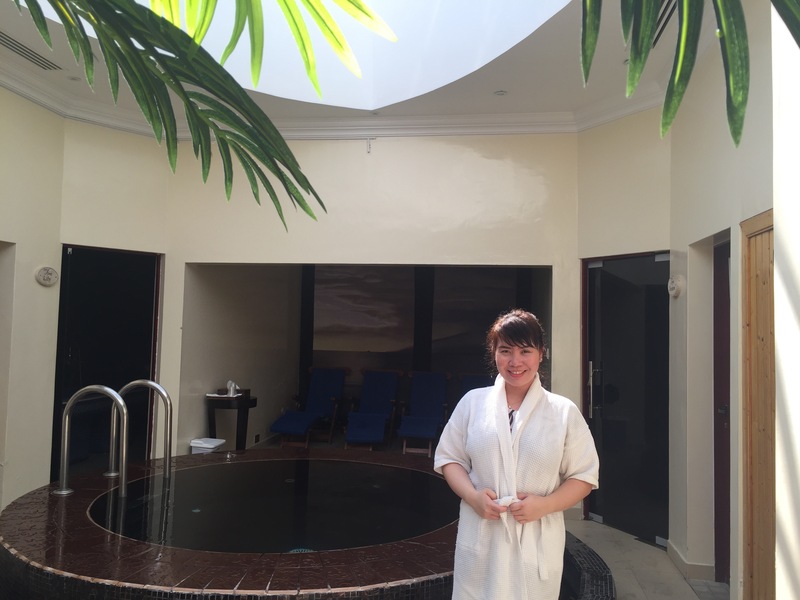 We started with Moroccan Hammam, Riva (the Spa therapist) explained the benefits of Moroccan bath which starts with applying black Moroccan soap on the body, followed by the steam for 15 minutes and then the most essential part, scrubbing and ends with the mud pack. We mostly forget to scrub the body which builds up the dead skin and dirt. The mud pack she used came from Moroccan volcano land, called Gazoor. When applied with water; it felt very warm on the skin, 🙂 No wonder, it came from the volcano land! After the refreshing massage, we moved to a Spa room for heavenly body massage. 60 minutes body massage with lavender oil strengthened the body while relaxing the mind. I felt calm and de-stressed. Riva has been working with Palma Beach Resort and Spa for 6 years and loves it there. She visits Dubai once or twice a year. She says, Umm Al Quwain is quiet and away from hustle and bustle. She wants to continue working there. Guests can also use the gym, steam and sauna facilities at Palma Spa. Palma Café: As soon as we reached the resort, they wanted to go to the beach and the waterpark. It was quite a task to take them out of that. Our kids enjoyed nuggets and fries at the restaurant; they didn’t want to go to bed coz they were having so much fun. Having a late night cappuccino, facing the blue lighted large pool was enchanting. Jet Ski: You can enjoy water sports such as Jet Ski, kayak etc at the resort. Barbecue Facility: Palma Resorts provides the barbecue facility to their guests. Families can bring their own food to enjoy and barbecue inside the hotel. There is one barbecue pit available in front of each room. As soon as you enter the resort, you feel overwhelmed with the architecture and surroundings. Our stay at Palma Beach Resort and Spa was a memorable one and we look forward to returning back soon. I will leave you all with some breathtaking views of the resort, enjoy! It might look at the photo blog but I couldn’t resist taking these pictures, hope you like it! Previous Post Thai Festival- Loi Krathong at Dusit Thani Dubai! Next Post Importance of Profile Picture!